No matter how wealthy or successful you are at this moment, I will assume that you are interested in learning to be more successful, improving yourself in every area, and being more successful. Otherwise you would not be reading this. 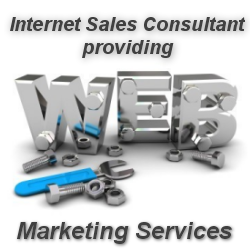 On this page I will have some resources that I have found to be extremely valuable. Take a look at them and see if you can benefit from them. All of them will be ones that I have personally experienced and you can contact me any time if you want to know what my experience was with them. Click here for a complete list of all of these ideas or just scroll down for a brief summary. If you’re like most entrepreneurs, you’re really good at what you do and that’s why you went into business to start with. But there’s a lot more to being successful in business than delivering a great product and service. Those other areas may be blind spots for you. And getting all the parts of your business that are critical to your success may be an elusive pursuit. And, that’s where we can help. If you want to stand out from your competition, strengthen your credentials, and get free publicity, then writing and publishing a book is your best option! Your book will become a lead generating tool that helps you boost your profits by securing highly paid speaking engagements and attracting more coaching and consulting clients. Don’t feel overwhelmed by the thought of writing a book. 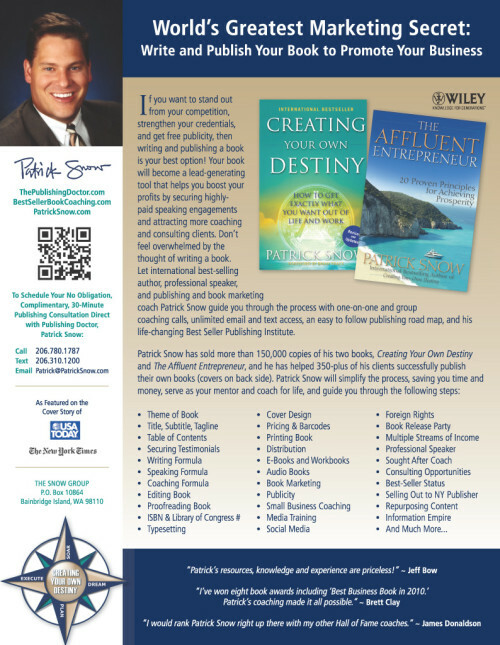 Let international best-selling author, professional speaker, and publishing and book marketing coach Patrick Snow guide you through the process with one on one and group coaching calls, unlimited email and text access, an easy to follow publishing roadmap, and his life-changing Best Seller Publishing Institute. Are You Hardwired For Success? Each of us has a personal money blueprint ingrained in our subconscious mind. And it is this blueprint that very often determines your financial life. Unfortunately, your current money blueprint may stay with you indefinitely, unless you learn how to identify it and change it. Most people go through life lacking the skills required to help them win the money game, and as adults are never quite able to achieve success financially. In general, people are lacking the financial education, the knowledge and the skills to build wealth… especially in a “slow” economy. In order to change your current situation, you need to change the way that you think first. You need to reinvent yourself for success in the current economy. This is where the Millionaire Mind Seminar comes in. 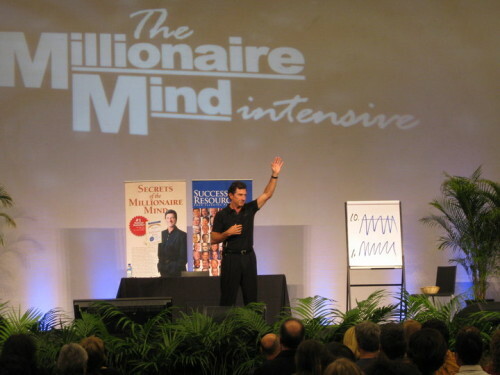 In this event, T. Harv Eker, best-selling author of the book ‘Secrets of the Millionaire Mind‘ teaches you how to re-program your attitude towards finance, as you discover the attitudes habits of successful people like Harv himself. This seminar was the best Seminar on wealth I have ever attended. Don’t miss going to one. It’s free. 1. Strategic Income: Benefit from 7 dividend investing improvements to compound, protect and increase your income. 2. 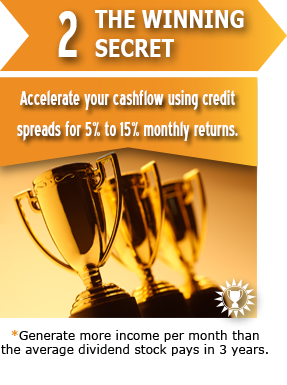 The winning secret: Accelerate your cash flow using credit spreads for 5% to 15% monthly returns. 3. Options success: Get fresh market commentary, the fastest moving stocks and 2 new trades per day. Empowering business professionals like you to overcome the curse of fear and the curse of knowledge that can derail a presentation, by sharing essential communication tools you can use to speak with more power, confidence and poise. ARE YOU READY to grow your business or excel in your job, but are too worried to stand in front of clients and effectively share your knowledge? DO YOU KNOW your subject, but when presenting you tend to read slide after slide of dense technical information hoping to get your audience to understand the needs of the project, but boring them instead? In today’s competitive business environment it is more important than ever to make an impact through presentations, evaluations and speeches. Yet most leaders, managers, sales people and job seekers are woefully unprepared to connect with the heart and mind of their audience to get results. 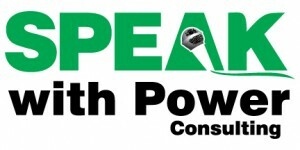 At SPEAK with Power Consulting we help business professionals overcome the curse of fear and the curse of knowledge that can derail communication. By teaching effective communication skills we help our clients to lead people, close sales and speak with more power, confidence and poise to audiences of 1, 1000 or more.